Some of the ideas about the safe operation of government reflected in the framework of the constitution are very interesting. The men who put the government together had some very particular goals in mind when it came to defending the nation without creating unnecessary threats to liberty. Their knowledge of the history of the destruction of earlier nations gave them great pause about military institutions. One of their fears was a standing army. They wanted a military that was prepared, but was mostly dispersed among the several states, and could be called up for Federal Service when needed. Originally this service was performed by the Militia in all its various forms, which supplemented the Army and fought throughout the entirety of the Revolutionary War. Early on, under the new Constitutional government, the militia Act of 1792 was passed. The Act was heavily debated, and as a result of the debates the President was given authority to call the Militia into Federal service. Over the next few years, some governors refused to send their Militia into the service of the Federal Government when called up. This even occurred during the War of 1812. The loosely formed Militia was eventually “by-passed” with the passage of the Militia Act of 1903 which created the National Guard and codified the circumstances under which the Guard could be federalized. This law replaced the Militia Act of 1792 and re-established on paper the Unorganized Militia, which would now consist of all able-bodied men between ages 17 and 45, and re-established the Organized Militia, which would still consist of the state militias, but known as the “National Guard,” supported by Federal funding. As a result of the Militia Act of 1903 the Federal Government had better supervision over the “National Guard” and more reliable access to it when needed. Specifically, the President of the United States was empowered to call up the various Guards to repel invasion, suppress rebellion, or enforce federal laws. The act was modified several times, with the passage of the National Defense Act of 1916, the National Defense Act of 1920, and amendments to the National Defense Act in 1933. The changes in 1933 created the National Guard of the United States as a separate component of the US Army, whose members (National Guardsmen) are both attached to their State National Guard (or militia) and the National Guard of the United States. In 1957, in response to the Little Rock Crisis, when Arkansas Governor Orville Faubus used the state’s National Guard to block the school house doors rather than allow court ordered integration, President Eisenhower federalized all 10,000 soldiers of the Arkansas National Guard, taking it out of Faubus' control, and simultaneously sent the 101st Airborne in full battledress to Little Rock. After Eisenhower had already made the decision and issued the orders, he spoke to the nation and said he nationalized the Guard and sent in the troops because he would not allow the country to descend into anarchy. We now have two governors, California Gov. Gavin Newsom and New Mexico Gov. Michelle Lujan Grisham, withdrawing their Guardsmen during what is observably a national crisis and anarchy at the U.S.-Mexico border – reflective of earlier days in the 19th century. 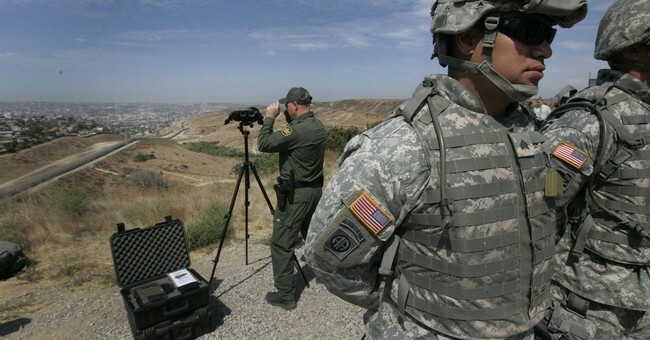 It would appear that this is a situation in which the current President, rather than tweeting about the governors’ actions, should utilize his authority as the Commander in Chief, federalize the entirety of the California and New Mexico National Guards and order whichever part of them he feels is required to remain at the border.